The BNC Adapter for the Analog Discovery tools enables the use of standard BNC terminated test leads and probes to achieve better attenuation for the oscilloscope tool in the WaveForms software. BNC probes are used to enable the measurement of higher voltage signals than what an oscilloscope can typically measure. A probe achieves this by changing the input impedance seen by the oscilloscope which is done by attenuating the signal, usually by a factor of 10X. The Analog Discovery tools can only display a maximum of 50 V peak-to-peak (limited from -25 V to +25 V), so it would not be able to safely measure a 200 V signal. The scope leads from Digilent are able to handle that voltage and can also use the 10X attenuation to instead present a 20 V signal to the Analog Discovery 2 scope input which can then be displayed. Because the BNC Adapter allows BNC probes to be used with the Analog Discovery tools, a higher bandwidth than can be traditionally achieved with the Analog Discovery tools can be utilized. 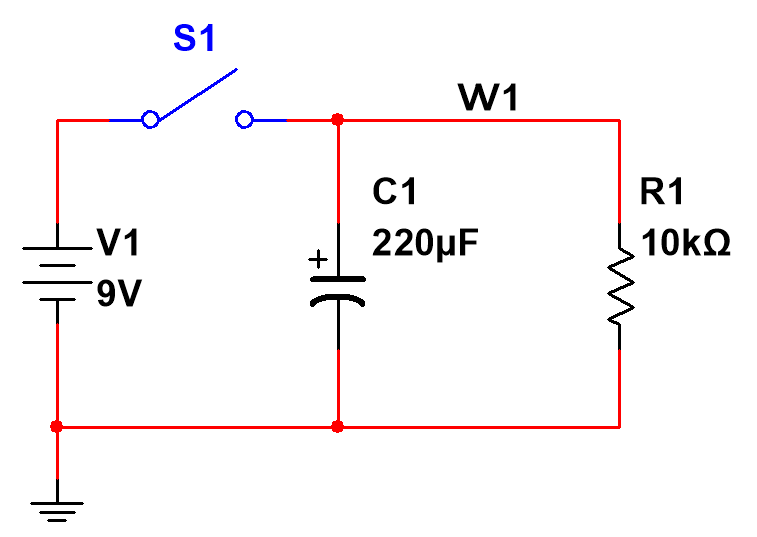 A simple circuit can be created to demonstrate the use of the BNC Adapter. To easily see the effect of attenuation, attach both probe leads to the positive side of the capacitor (the wire labeled W1 in the diagram above). These leads are attached to the positive scope inputs on the Analog Discovery; the negative scope inputs on the Analog Discovery tool are grounded on the BNC Adapter so only single ended measurements can be taken. Be sure to also attach the probe ground clips to ground as well to avoid shorting the probe as the BNC adapter board does not support differential voltage measurements. When the two Oscilloscope channels are set to be DC coupled on the BNC adapter, the following waveform can be observed when the switch is turned off, disconnecting the power to the circuit. 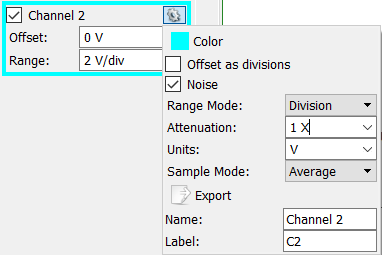 Notice that the voltage amplitude on Channel 2 (10X compensated probe signal) is proportionately 10 times smaller than Channel 1 which is not applying any attenuation. It is possible to proportionally change the attenuated signal to reflect the actual signal voltage by clicking on the gear box associated with the oscilloscope channel measuring the attenuated signal and changing the “Attenuation” dropdown box to match the attenuation level. This helps reveal some information about a large signal that is outside the recommended voltage range for an oscilloscope. The BNC adapter also supports a AC coupled setting to create a high pass filter and remove any DC offset from the sinusoidal signal. More information on the BNC Adapter can be found on its Resource Center. All questions about the BNC Adapter can be asked on the Scopes and Instruments section of the Digilent Forum.